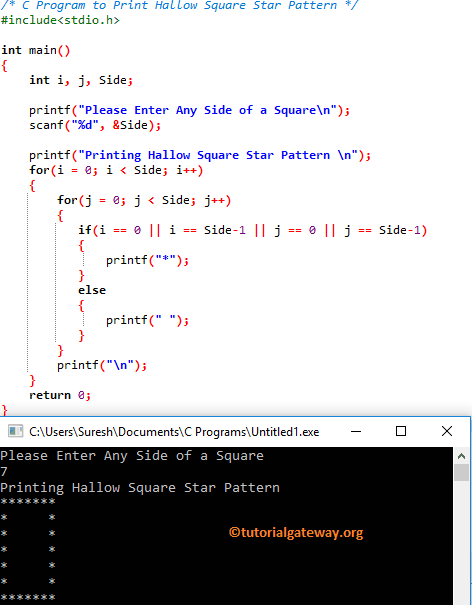 In this article we will show you, How to write a C Program to Print Hollow Square Star Pattern with example. And also show you, How to print hollow square pattern with different symbols. This C program allows the user to enter any side of a square (In Square all sides are equal). This value will decide the number of rows, and columns of a hollow square. Here, we are going to print the stars until it reaches to the user specified rows, and columns. This will happen until it reaches to 7 and after that both the Inner Loop and Outer loop will be terminated. This C program allows the user to enter the Symbol that he/she want to print as hallow square pattern.